Woah! Ok, so here's a first - and quite a milestone for RGCD. 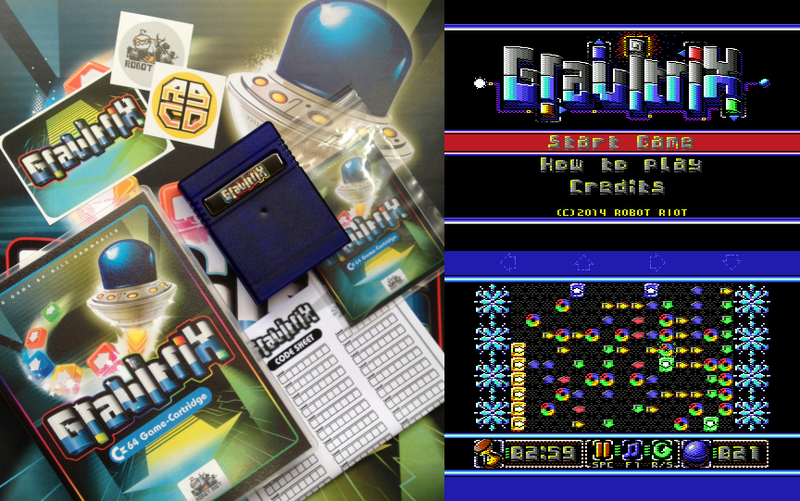 GRAVITRIX, the long-awaited and totally-ace gravity-themed puzzle 'em up by Robot Riot Games, was released a couple of weeks back on our all-new 512KB cartridge PCB developed by new RGCD member Siem Appelman together with Shareware Plus. 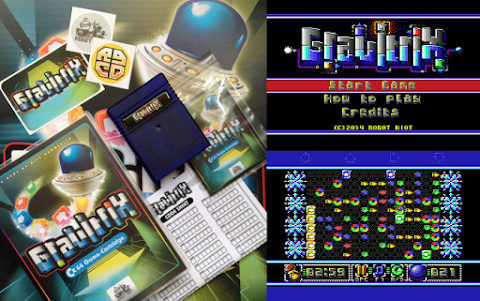 An updated rework of an unreleased game that Nils Hammerich originally completed over 20 years ago, GRAVITRIX brings arcade-style, mind-bending puzzle-action to your Commodore 64 like never seen before! To complete each of the 120 levels, you must clear the screen of all of the coloured GRAVITRIX stones. ALL of the stones of EACH colour must be connected in a single 'group' in order for them to vanish, ie. you cannot have multiple, unconnected groups of the same colour in different areas of the screen. The big challenge in GRAVITRIX is that the stones don't just have different colours - they have different 'directions' (or gravity) as well! Each coloured stone 'falls' in its assigned direction (symbolised by an arrow) whenever there is nothing blocking its path, and this leads to some tricky chain reactions that must be solved. To make your life even harder there is also a time limit, environmental blocks and other gameplay elements that are introduced during the early levels. Available to purchase on cartridge (with an initial limited run of 50 numbered copies), 5.25" diskette or even as a digital download, GRAVITRIX is superb fun - but don't take our word for it, grab yourself a copy of the free demo from our itch.io page! Pandimensional Conga Combat: Interface Swoosh! So, with three days booked off from real-life work, I set out my battle plan. On day one I'd tackle the entire front end, right the way through to Conga's 'Casual' play mode, then take on the scores and achievements on day two and round off with multi-player on day three! Oh well, one out of three isn't too bad! No, thankfully this isn't a sombre simulation of the miserable existence of a long-suffering Wolverhampton Wanderers fan. In contrast, Wanderers: Chained in the Dark is a swords and sorcery mini-epic in 128KB, featuring trolls, demons and fantastical creatures that are all frankly a little on the cute side to disturb this seasoned adventurer. There is a distinct lack of this type of game on our beloved Speccy. It's a rather excellent RPG adventure in the Japanese style, by which I mean: when you encounter a baddie you are whisked into a combat mode and obliged to take turns thrashing each other. I always found the game mechanic rather bizarre but perhaps it was a natural progression from pen and paper RPGs to this. I don't recall this style of game gaining popularity in the UK until the advent of Final Fantasy VII in the 90s, and by then the Spectrum was commercially dead and in any case unable to handle the size of contemporary RPGs.